Today I am so excited to share with you about one of my favorite things in the whole world, Wiseman House fine handmade chocolates. These scrumptious morsels are made in the small town of Hico, Texas which is not that far from where I live. I was first introduced to these chocolates by some friends a few months ago. I can honestly say they are the most delicious chocolates I've ever put in my mouth. I was sent an assortment of truffles to review. I do not know how to adequately put into words how wonderful these truffles are. The are rich, smooth, and creamy. If I had to choose one word to describe them it would be luxurious. I think what makes these chocolates so special is they are made from the highest quality ingredients by a truly amazing chocolatier. Those two things make an out of this world chocolate! Everyone of them offers a unique taste sensation. You can read about each of the chocolates here. They are all amazing but my personal favorites are Love Potion, southern Hospitality, and Seville Orange. I was also sent almond toffee to review. Oh my, this stuff is rich, creamy, and oh so buttery. I am normally not a big toffee fan, but found myself not wanting to share this. Covered with chocolate and an almost crust, this is a seriously rich indulgence. A little goes a long way! This is the best toffee I've ever eaten. You really need to try some. 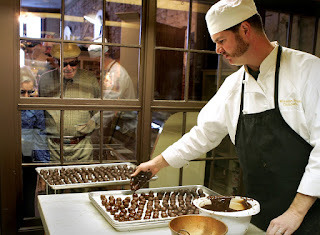 It blows my mind that Kevin Wenzel makes all these chocolates by hand, in Hico of all places. Check out the Wiseman House story to find out more about the couple behind these yummy delights. In my opinion, these are some of the finest chocolates and confections in the world and the fact that they are made locally makes me very happy. Obviously, I think any of the products I reviewed would make excellent holiday gifts. I am very picky about my chocolate and can be perfectly happy eating nothing but Wiseman House products for the rest of my life! In fact, when asked what I wanted for Christmas, Wiseman House was my simple reply. Your family and friends will be extremely impressed if you get them gifts from Wiseman House. I have my fingers crossed that my husband gets me what I asked for. So, now to share with you. Wiseman House is giving a 1lb. box of their delectable Sipping Chocolate to one lucky reader. Go explore their site and come back leaving me a comment on what you would most love to try. This is mandatory for entry. Deadline to enter is 11:59pm CST on 12/16/09. Good luck! I want to try their Pecan Caramel Clusters! I'm now following you on Networked Blogs. Comment #3 for following you on Networked Blogs. Comment #4 because I'm following you on Networked Blogs. I want these chocolates! Okay, I'm done. Comment #5. Follow with Google Friend Connect. I would love to try their Almond Caramel Clusters. I would LOVE to try the Pecan Caramel Cluster! The almond toffee looks way too good. Great giveaway I love hot chocolate. I like to try the Almond Toffee. I follow thru Google Friend Connect. I would like to try the Wild Woman Collection of Truffles, I'm sure I'd love them all! The Signature Gift Baton is a fun idea! It's just enough! Besides the Sipping Chocolates, the one I would choose would be the Pecan Caramel Clusters. It was so hard to decide. They all looked and sound delicious. The Almond Bark looks yummy! WOuld love the Wild Woman Truffle Collection!! MMMM almond toffee. I love me some great homemade toffee. Would love to try the Pecan Caramel Cluster...mmmm caramel! I would love to try the Dark Rufus truffles! I'd love to try the Pecan Caramel Clusters. I follow through Google Connect. I'd like to try their pecan caramel clusters! mmm... the Texas Pecan truffle sounds good! I'm dying for the toffee and joined Network Blogs. Oops, forgot my orignal mandatory comment--I love their truffles. Amazing they don't have problems with them melting in Texas? Their Mocha Crunch Bark sounds divine! 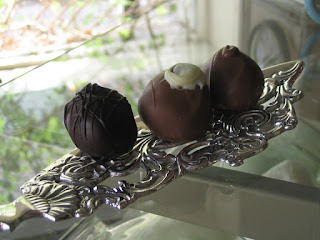 How I would love to try the Seville Orange and Snooky truffles!! They sound heavenly!